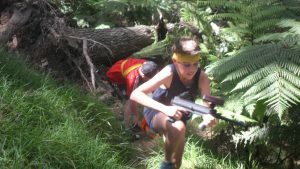 Outdoor Laser Tag is an awesome scenario based game perfect for anyone over 7yrs old. There’s no mess, no pain, no heavy armour to wear, no masks required and the markers are conveniently lightweight and easy to use. 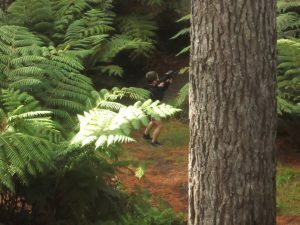 The Laser Tag field has hidden bunkers, ferns, a creek, high and low vantage points and plenty of trees – all adding to the excitement factor as you stalk your opponents. Screening from our Paintball fields separates play and you still have access to our covered BBQ area and viewing platforms. Can we play Laser Tag if it's raining? Sometimes. If it’s really raining hard we unfortunately can’t run the games as the electronics don’t appreciate getting wet! However, normally showers are fine as we’ve got undercover areas we can camp out in if necessary. What should we wear and bring to our event? Older clothing and closed in footwear are a good idea. You can hire overalls from us if you’d like for $5pp. We do provide water to drink but your own water bottle is also advisable. You’ll be with us for about 1.5 hours. As we don’t limit your ammunition or ‘health’ on the marker during your session we’ll play as many games as we can. Each game will be approximately 10 mins long. How old do I have to be to play Laser Tag? Does it hurt when I get shot? No, the lasers are completely harmless, you’ll feel nothing at all but will hear your gun beep! We've got one player who's under 7 yrs old ..can we do anything for them? 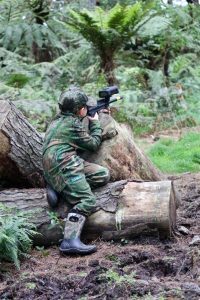 Yes, we can offer you Paintball Target Shooting for that child, talk to your facilitator on the day about adding this into your event. See our pricing page for costings. How does the Laser Tag marker work? 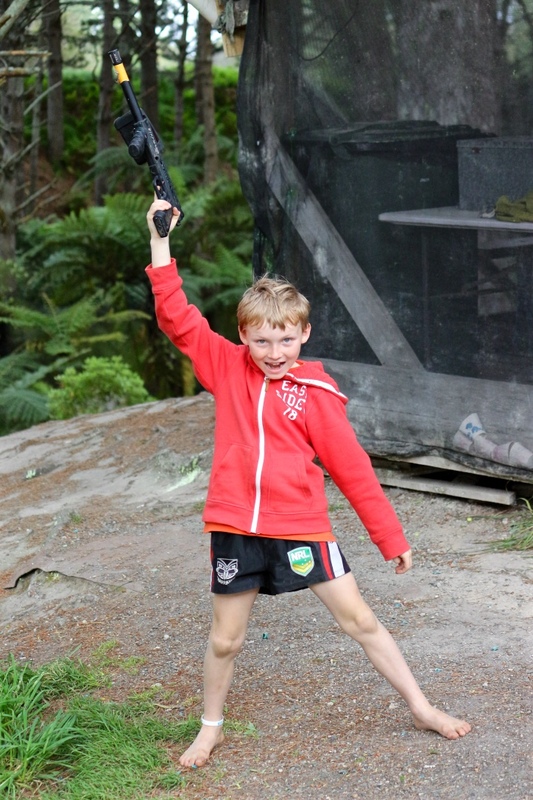 The clever people at Tippman have adapted their paintball markers adding the high-tech Eagle Eye Laser Tag system, and we’ve imported the final product in from the USA so you can get to experience this awesome activity at Hinterland Adventures venue at Horotiu, Hamilton. The action of pulling the trigger creates a ‘bang’ sound and activates the infra-red signal, shooting it at the opposition team player, while the receiver keeps track of all the hits. A hit to the receiver from any angle will register a hit & your cue to walk back to the re-entry point before re-joining the game! 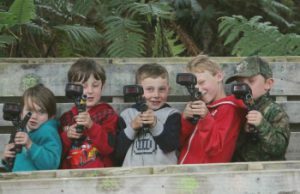 Laser Tag is held on our fields at the end of Hutchinson Road, Horotiu. Bookings are essential. Site access only during your session.